Just thinking of the word Perspective tweaks my brain a tad. There are so many points to consider. Last night, my boys and I worked on the idea of a Vanishing Point in art. We looked at some YouTube videos of learning to draw a scene based on a single vanishing point, and all the lines you should draw across the scene to make sure everything is in the proper perspective… then you erase the lines, and voila, your picture is in perspective. 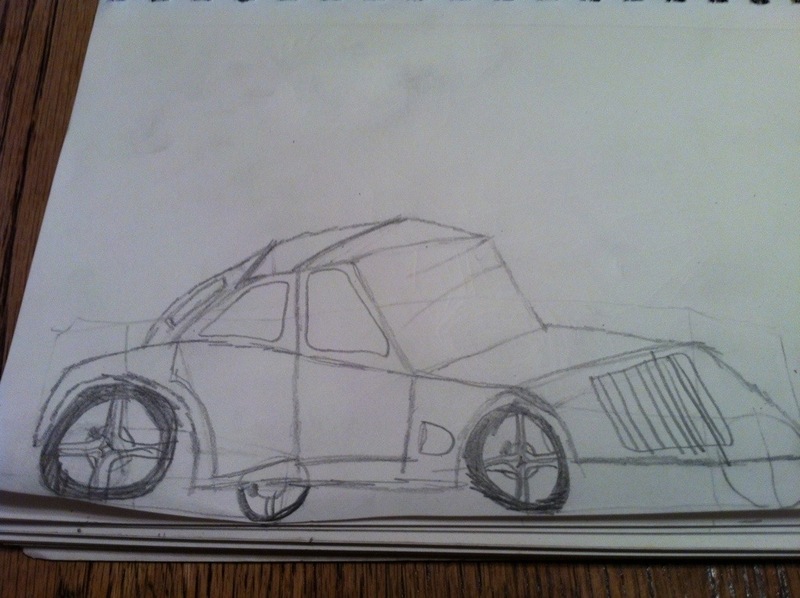 What really captured their imaginations was when I played a YouTube video that showed how to draw a car by starting with very basic shapes of circles and spheres, and drawing the perspective lines all over to get the depth and fullness right, then adding in the details. Ben was trying to follow along, but he hasn’t quite figured out the Vanishing Point idea, so his car is catywampus and gorgeous (of course, to mom) in its beginner’s view. The whole point of doing Art on Language and Literature Night was to bring in the poem by Billy Collins, Vanishing Point, which I love for any number of reasons. It was over their head, since they are just starting to get the idea of what a vanishing point in art is all about. No matter, they have heard the thought. It will rattle around in their little brains and catch on something as they learn other things. That is the idea behind Philosophy and Thought, after-all, is it not? We have all these ideas, and they bump up against one another in our brains, and sometimes turn into something lovely. Sometimes, as they percolate, they become poems. Other times, they turn into questions that work themselves into ponderings and ramblings and become theorems to consider or work out. With little engineer brains, any number of ideas must go in there, get stirred together and become the fodder for even better ideas in the future. The whole while we were working on design and drafting and learning perspective and reading poetry tonight, Bean was practicing his numbers with a big marker and his blue and red lined paper with the dotted lines running at mid-point through the rows. He kept running around from his side of the table to get big hugs and to show me a 12 or a 19, proudly, numbers backwards half the time, but he is learning and he is so happy to be part of the table of study after dinner.